With this public library in Melbourne’s Docklands, Clare Design shows how a small, community-minded building can help instil a still-young urban precinct with a sense of place. From Dubai to Shanghai, the world is currently full of such non-places, some built, thousands planned. Closer to home, we frown at Perth’s addled embrace of its urban fortunes and await Barangaroo – Sydney’s latest dalliance with urbs – with trepidation and a healthy dose of scepticism. In Melbourne, it’s been the same with Docklands – a long process of populating three windswept mini-coasts with high-rise apartments, massive offices for ANZ and NAB banks, and many saying behind their hands, “I told you so – this wouldn’t work – I wouldn’t live here.” But things have changed. Docklands has become a city. It has places of exchange (two supermarkets and plenty of shops and restaurants as well as the huge offices). It has housing. It has a kindergarten and childcare centre (though not yet a school). It has an abundance of requisite public art, some of which has been specially designed to mitigate the chilly winds coming off the water. It even has its own stadium. And now, Lindsay and Kerry Clare of Clare Design have designed what might be considered this entire development’s true urban heart: a tiny public prism that may keep this new city alive. The small library, which also contains within it a series of other public functions, is part of the City of Melbourne’s strategy of inserting or updating public libraries across the municipality. 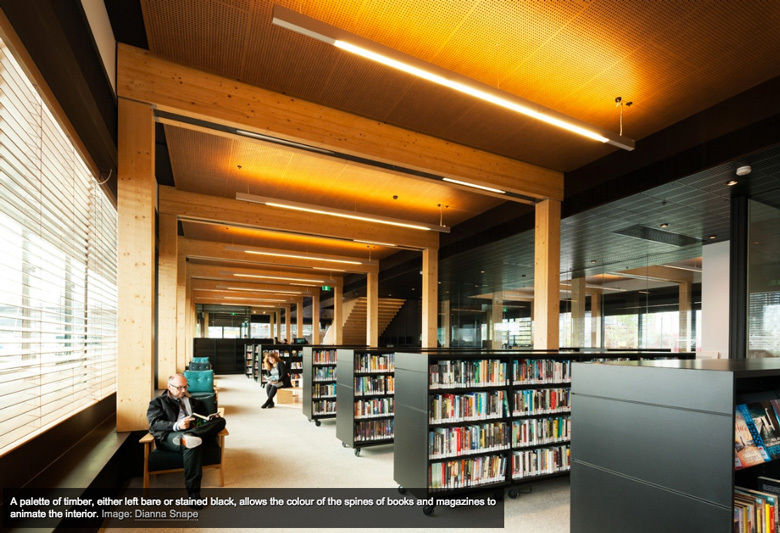 For Rob Adams, director of city design at City of Melbourne, each library was to be an urban exemplar, not just in terms of knitting together context, morphology and public space, but also in pushing the boundaries of technology, especially with regard to responsible environmental design. 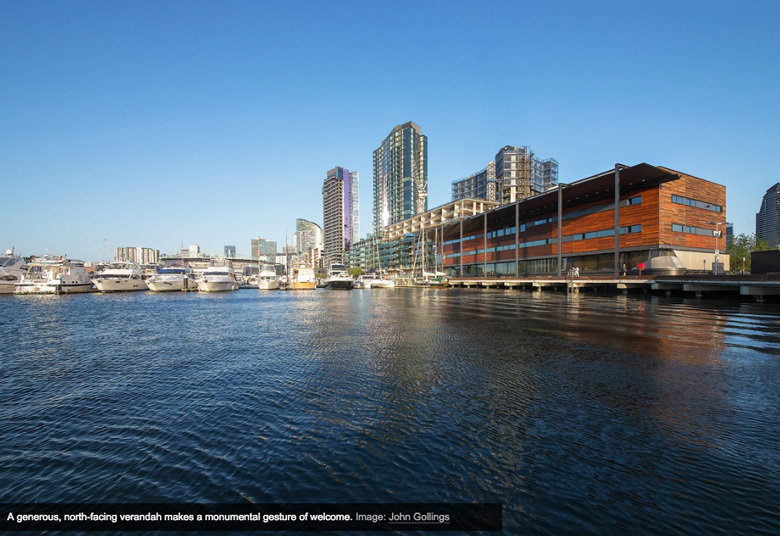 Adams commissioned Sydney-based architects Lindsay and Kerry Clare to investigate a series of hypothetical projects for various sites in Docklands, in effect testing the potential of this new city at Melbourne’s edge to embrace some form of civitas. The exercise was invaluable in demonstrating that the intervention of a small, community-based building could have significant impact. Places Victoria, the City of Melbourne and Lend Lease entered a tripartite agreement to deliver Victoria Harbour, including Dock Square and the library, which revert to City of Melbourne ownership and management. In the end, the site chosen was at the hinge point of the central strip of dock in Victoria Harbour that is still to be developed. The Clares designed a three-storey rectangular box – each level with a floor area of 1000 square metres – and placed it close to the northern boardwalk. Critically, they added to the box a giant, north-facing verandah, a monumental gesture of welcome, climatically sensible, but also an echo of Melbourne’s archetypal public signifier since the 1840s: the urban verandah. These two gestures – placement on the site and the big verandah – were fundamental, as the building was being value-engineered to within an inch of its life. The Clares, working closely with Hayball in Melbourne on documentation and the City of Melbourne’s City Design on the interior fitout, developed the design to meet strict cost constraints and unusual construction challenges. 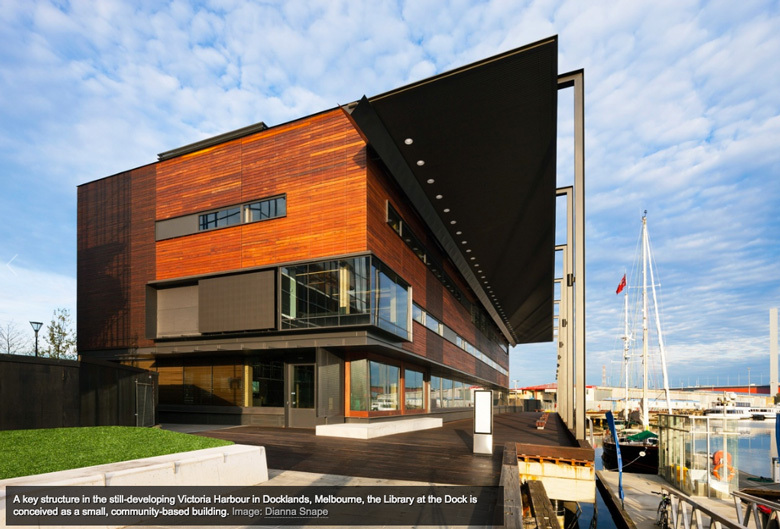 Located on Victoria Harbour’s seventy-five-year-old timber piled wharf, the building had to be light and its weight evenly distributed. And so this new public building became a timber box, constructed almost entirely of cross-laminated timber (CLT): European spruce sourced from Austria and manufactured there in less than a week by Stora Enso. In addition to CLT, which includes the floor slabs, the building has been constructed with Glulam posts and beams, and recycled ironbark and tallowwood for the external cladding. 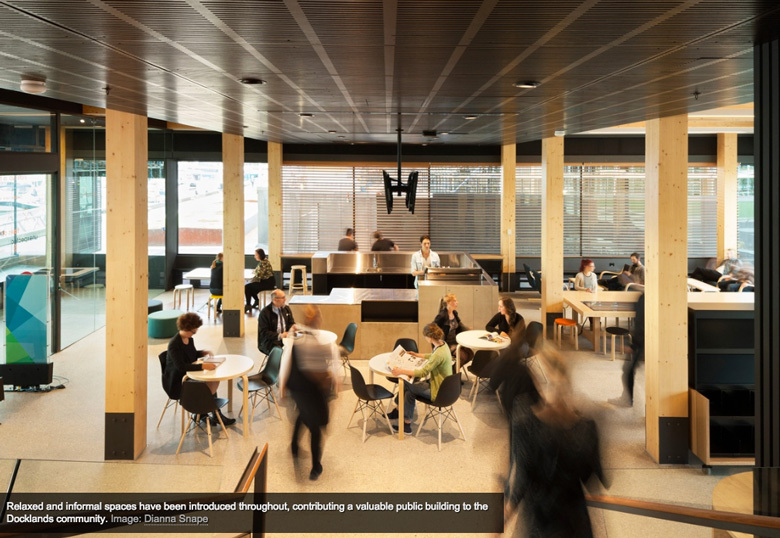 The Glulam and CLT arrived in Melbourne packed into twenty-one shipping containers containing 1600 parcels, 110,000 nails and nearly eight tonnes of brackets – in short, a flat-pack building in the tradition of Swedish furniture giant IKEA. The building was then put together like a kit of parts and sheathed in the recycled timber, its edges detailed by the Clares with the precision of Prouvé and Chareau to create a breathing, self-ventilating box. With a series of features that includes a passive natural ventilation system supplemented by mechanical operable louvres on all four sides, 85 kW solar panels on the roof, water harvesting for flushing toilets, central skylights that act as ventilation chimneys, low VOC and formaldehyde materials, and all furniture and fitout meeting Green Star ratings – in addition to, surprisingly, minimal energy used in shipping the timber from Austria – the Library at the Dock was awarded Australia’s first 6 Star Green Star Public Building Design PILOT rating. This is no mean feat. Given the Clares’ longstanding interest in design that is fit for climate, their shared experience of working for Gabriel Poole, Lindsay Clare’s childhood experiences of a Nissen hut on Bribie Island adapted for climate with the addition of adjustable window flaps, Kerry Clare’s admiration for the lean and clever spareness of Christopher Kringas’s 1960s design for her father’s Citroen car showroom in Sydney, and their environmentally careful design as design directors of Architectus for the Gallery of Modern Art (GOMA) in Brisbane, it is understandable that this little building was going to be, and is, dense with ideas. First, the Library at the Dock is not just a library. In addition to its collection of 60,000 books, CDs and DVDs, it has multiple functions contained within it. At ground level, there’s a cafe on entry, as well as the necessary functions of information, book borrowing and return. Everything, including the columns, is timber, either left bare or stained black. It’s an effective palette as the spines of books and magazines lend the interior the rest of its colour. On the bleak Melbourne day I visited, the library felt Scandinavian. I could have been in Denmark. This had as much to do with the architecture as with the relaxed and informal functions that were added onto the library program. On the first floor is a gallery that can be hired out. On the second floor at the western end is a 120-seat theatre space with retractable seating. On the same floor there’s a recording studio as well as a semi-outdoor terrace where a father and son were playing table tennis on artificial grass, and where louvred walls and roof can open up to the park view and the sky for natural ventilation. In the dedicated kids’ reading area there are delightful, child-scaled curving shelf units designed by the Clares that recall the space-making strategies of Aldo van Eyck. Architecturally, the unifying element within all of this is the nine-tonne central stair. Craned into place and with the feel of a packing crate transformed artlessly into an elegant public stair, this is the other elemental public signifier of the project, something the Clares refer to in their work as “open invitations.” The Clares don’t over-intellectualize their work and it is this strategy that imparts a relaxed humility to their buildings generally. In Docklands, the Clares’ building takes on a role that a municipal library took on in the suburbs in the 1950s but with extra functions: an unassuming identity that will become an intrinsic component in building community. A simple idea perhaps, but it is a strategy that lifts this project to a level of significance to which others aspire but do not reach. And fundamentally this is because of the rigour of its responsible making and the complete satisfaction of its brief. This little building is quiet in form and language but loud in its urban ambition. Given its already high usage (60,000 visits in the first three months), it is indisputable proof of a beating moment in a place about to find its heart.